The county heats for the Young Farmers’ Clubs of Ulster annual ‘build it’ competition recently took place at livestock marts throughout Northern Ireland. 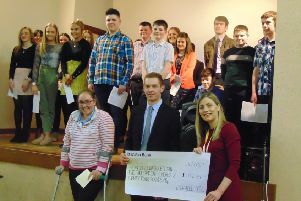 The popular competition, supported by Grassroots Challenge brought YFCU members together with a common task, to design and build a bug hotel. The sun shone as YFCU teams began their task. Competitors were required to build a free standing bug hotel which had a base that was raised at least 20cm, a back, two sides and a pitched roof. Any decorations members wished to use had to be made from recycled or natural products. With this brief in mind teams began to build their bug hotels. After a period of time teams presented their finished pieces to a judge who assessed and scored their handiwork. The top team from each county will now progress to the ‘build it’ competition final which will be held at Castlewellan Show on Saturday, July 14th. YFCU would like to extend thanks to Rathfriland Mart, Enniskillen Mart, Swatragh Mart and Ballymena Mart for hosting these heats. Thanks also go to Grassroots Challenge for supplying the materials and to the judges for giving of their time to assess the members’ entries.